The southwestern People's Republic of China region. 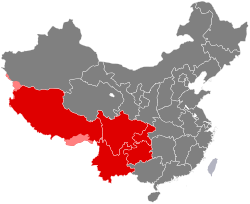 Southwest China (Chinese: 西南; pinyin: Xīnán) is a region of the People's Republic of China defined by governmental bureaus that includes the municipality of Chongqing, the provinces of Sichuan, Yunnan and Guizhou, and the Tibet Autonomous Region. ^ Chongqing core area only, satellite urban area separated from Chongqing core area is not included. ^ Dongchuan is a satellite urban area separated from Kunming and it is not included. ^ a b c 国务院人口普查办公室、国家统计局人口和社会科技统计司编 (2012). 中国2010年人口普查分县资料. Beijing: 中国统计出版社 [China Statistics Press]. ISBN 978-7-5037-6659-6.